The Swedish metal heroes often tackle controversial material in their music, such as on the track The Final Solution from 2010 album Coat Of Arms. The song deals with the Holocaust, while their 2005 debut album Primo Victoria includes the word ‘Nazi’ in the lyrics, leading to a ban for the record in Germany. Frontman Joakim Broden tells Metal Hammer: “Nobody would ask Stephen Spielberg if he was a Nazi because he made a movie about the Holocaust. And on the furore surrounding Primo Victoria, Par Sundstrom adds: “It’s totally understandable that you can misunderstand Sabaton if you hear a bit of a song and don’t know where it comes from. “It was harder in the beginning. Our first album was denied release in Germany because it contained the word ‘Nazi’. They thought it was neo-Nazi propaganda. 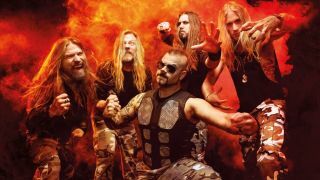 Sabaton’s eighth album The Last Stand is released on August 19 (Friday) via Nuclear Blast. The full interview with Sabaton features in issue 287 of Metal Hammer magazine, which is available now in print and via TeamRock+. Find out more about TeamRock+ and sign up here.